an educational approach concerned with developing an aesthetic discipline, supporting a formgiving process aimed to create tangible artifacts. 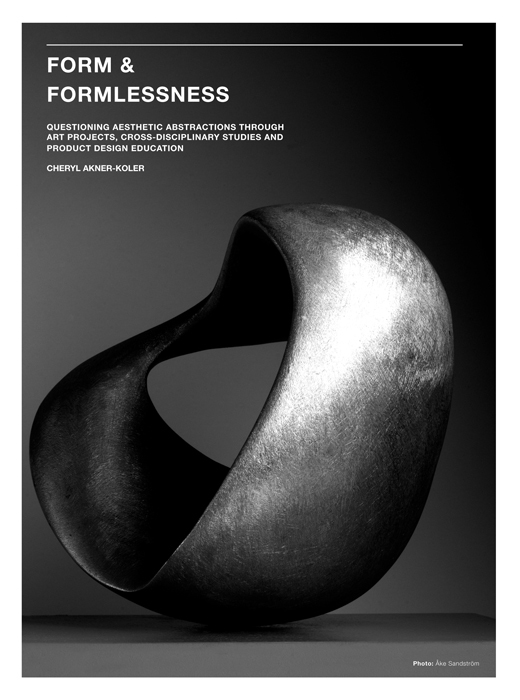 an art-based approach supporting an open exploration of distortion and formlessness. a cross-disciplinary exploratory approach concerned with aesthetic experiences shared in laborations demonstrating complexity and transformation. The thesis offers methods and models that both support and challenge the normative concepts of beauty, with high relevance for teaching 3-D formgiving aesthetics and research by design methodologies. Cheryl Akner-Koler is professor in form theory and practice at the Department of Industrial Design at Konstfack University of Arts, Crafts and Design in Stockholm, Sweden. She is an active sculptor and has driven many collaborative art/ science projects on themes such as empty space, infinity and complexity. Form and Formlessness is her doctorial thesis.